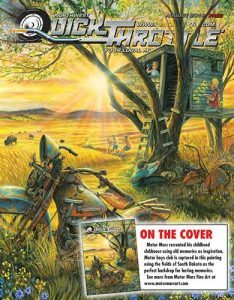 Renowned artist Marc Lacourciere (Motor Marc) will be unveiling a new commemorative painting at the 2018 Sturgis Motorcycle Rally. Marc is an exceptionally gifted internationally premiere artist known for his extraordinary works of art that include classic automobiles and motorcycles, rock legends, pirate and fantasy art. 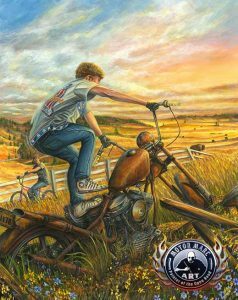 He has captured the history, heart and soul of the Sturgis Rally in his 75th Anniversary Editing Paintings. These paintings are my tribute to the world’s greatest Motorcycle rally and its Legends,” says Marc. The Sturgis Motorcycle Rally will take place August 3rd – 12th. The Rally began in 1938 as the Black Hills Classic with a race of nine participants and a small audience. 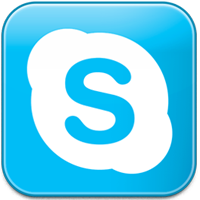 It now hosts as many as six-hundred thousand participants from all 50 states as well as from Canada and dozens of other countries including Japan, Australia, Germany and England. To view Motor Marc’s artwork in person during the Sturgis rally, visit the gallery at the Black Hills Harley-Davidson Dealership in Rapid City, SD.